This paper proposes two techqniues to construct an efficient gradient stencil for a cell-centered finite-volume method on unstructured grids. Finite-volume solvers are known to get unstable if the gradients are computed with face neighbors on triangles and tetrahedral grids. Then, the face-neighbor stencil needs to be augmented with extra cells. This paper shows how to select a minimal number of extra cells to ensure robustness on distorted grids. Jeffery A. White, Hiroaki Nishikawa, and Robert A. Baurle, "Weighted Least-squares Cell-Average Gradient Construction Methods for the VULCAN-CFD Second-Order Accurate Unstructured-Grid Cell-Centered Finite-Volume Solver", AIAA2019-0127, AIAA Scitech 2019 Forum, 7-11 January 2019, San Diego, California. Hiroaki Nishikawa, "An Implicit Gradient Method for Cell-Centered Finite-Volume Solver on Unstructured Grids", AIAA2019-1155, AIAA Scitech 2019 Forum, 7-11 January 2019, San Diego, California. Lingquan Li, Jialin Lou, Hong Luo, and Hiroaki Nishikawa, "High-Order Hyperbolic Navier-Stokes Reconstructed Discontinuous Galerkin Method", AIAA Paper 2019-1150, AIAA Scitech 2019 Forum, 7-11 January 2019, San Diego, California. Hiroaki Nishikawa and Yi Liu, "Third-Order Edge-Based Scheme for Unsteady Problems", AIAA Paper 2018-4166, AIAA 2018 Fluid Dynamics Conference, 25 - 29 June 2018, Atlanta, Georgia. [ bib | pdf | slides ] This work shows that a third-order low-dissipation scheme can be a very useful and practical tool for high-fidelity simulations. It focuses on what we should expect from 3rd-order and 4th-order schemes (i.e., low dispersion and low dissipation), and then move on to make a smart decision to develop a 3rd-order low-dissipation scheme as an economical option for practical CFD codes, rather than going to 4th-order schemes. This paper shows that an implicit gradient algorithm can be derived from a hyperbolic diffusion. The derived implicit Green-Gauss gradient method preserves accuracy on irregular grids, achieves fourth-order accuracy on rectangular grids, and yields highly accurate gradients on highly-curved thin grids typical in high-Reynolds-number simulations. It requires iteration, but can be efficiently combined with an iterative finite-volume solver, which potentially reduces the cost of the conventional finite-volume solver with LSQ gradients as per-iteration-cost can be cheaper than the LSQ gradients. Hiroaki Nishikawa and Yi Liu}, "Third-Order Edge-Based Scheme for Unsteady Problems", AIAA Paper 2018-4166, AIAA 2018 Fluid Dynamics Conference, 25 - 29 June 2018, Atlanta, Georgia. Jialin Lou and Lingquan Li and Hong Luo and Hiroaki Nishikawa}, "Explicit Hyperbolic Reconstructed Discontinuous Galerkin Methods for Time-Dependent Problems", AIAA Paper 2018-4270, AIAA 2018 Fluid Dynamics Conference, 25 - 29 June 2018, Atlanta, Georgia. [ bib | pdf ] To my surprise, Jialin Lou and Lingquan Li discovered that the hyperbolic rDG schemes can be integrated in time by explicit time-stepping schemes without losing accuracy. I found it very interesting how explicit time stepping is made possible by an extended test function, which arises from an efficient construction of hyperbolic rDG schemes. I never thought time accuracy would be obtained with explicit methods, but this work shows that nothing is impossible. Lingquan Li and Jialin Lou and Hong Luo and Hiroaki Nishikawa, "A New Formulation of Hyperbolic Navier-Stokes Solver based on Finite Volume Method on Arbitrary Grids", AIAA Paper 2018-4160, AIAA 2018 Fluid Dynamics Conference, 25 - 29 June 2018, Atlanta, Georgia. [ bib | pdf ] This paper introduces a new hyperbolic Navier-Stokes (HNS) formulation, HNS20G, which directly uses the gradients of the primitive variables as additional variables. It greatly simplifies the construction of arbitrary high-order schemes for the HNS system. A family of very efficient high-order hyperbolic-rDG schemes are presented. These schemes are more accurate than conventional DG schemes wth fewer degrees of freedom. Unsteady cases are also presented. The hyperbolic method is demonstrated for diffusion with discontinuous coefficients. This paper shows that the hyperbolic scheme can produce exact piecewise-linear solutions for diffusion with discontinuous coefficients. Jeffery A. White, Robert A. Baurle, Bradley J. Passe, Seth C. Spiegel, and Hiroaki Nishikawa, "Geometrically Flexible and Efficient Flow Analysis of High Speed Vehicles Via Domain Decomposition, Part 1, Unstructured-grid Solver for High Speed Flows", JANNAF 48th Combustion 36th Airbreathing Propulsion 36th Exhaust Plume and Signatures 30th Propulsion Systems Hazards Joint Subcommittee Meeting Programmatic and Industrial Base Meeting at Newport News, VA, 2017. [ bib | pdf ] The alpha-damping viscous scheme AIAA-2011-3044 has been implemented into NASA's VULCAN code for hypersonic chamically-reacting flow applications, and demonstrated its robustness for hypersonic simulations on unstructured grids. Boris Diskin and Hiroaki Nishikawa, "Customized Grid Generation Codes for Benchmark Three-Dimensional Flows", AIAA Paper 2018-1101, 56th AIAA Aerospace Sciences Meeting, 8 - 12 January 2018, Kissimmee, Florida. [ bib | pdf | slides ] This paper describes the grid generation codes developed for Solver Technology for Turbulent Flows: Consistently-refined families of hemipshere-cylinder and ONERA M6 wing grids. Boris Diskin, William K. Anderson, Mohagna J. Pandya, Christopher L. Rumsey, James L. Thomas, Yi Liu, Hiroaki Nishikawa, "Grid Convergence for Three Dimensional Benchmark Turbulent Flows", AIAA Paper 2018-1102, 56th AIAA Aerospace Sciences Meeting, 8 - 12 January 2018, Kissimmee, Florida. Jialin Lou, Lingquan Li, Hong Luo, Hiroaki Nishikawa, "First-Order Hyperbolic System Based Reconstructed Discontinuous Galerkin Methods for Nonlinear Diffusion Equations on Unstructured Grids", AIAA Paper 2018-2094, 56th AIAA Aerospace Sciences Meeting, 8 - 12 January 2018, Kissimmee, Florida. [ bib | pdf ] This paper proposes a new hyperbolic diffusion formualtion for nonlinear diffusion equations, which is suitable for the high-order disconsinuous Galerkin methods. Lingquan Li, Xiaodong Liu, Jialin Lou, Hong Luo, Hiroaki Nishikawa, Yuxin Ren, "A Discontinuous Galerkin Method Based on Variational Reconstruction for Compressible Flows on Arbitrary Grids", AIAA Paper 2018-0831, 56th AIAA Aerospace Sciences Meeting, 8 - 12 January 2018, Kissimmee, Florida. H. Nishikawa and Y. Nakashima, Dimensional Scaling and Numerical Similarity in Hyperbolic Method for Diffusion, Journal of Computational Physics, Volume 355, January 2018, Pages 121-143, 2018. [ bib | pdf | journal ] This paper discusses issues in appying the hyperbolic method for dimensional diffusion equations. The length scale Lr needs to be scaled properly, or it won't work well. This is important also for non-dimensionalized equations over a non-square domain. H. Nishikawa and Y. Liu, Hyperbolic Advection-Diffusion Schemes for High-Reynolds-Number Boundary-Layer Problems, Journal of Computational Physics, Volume 352, January 2018, Pages 23-51, 2018. Jeffery A. White, Robert Baurle, Bradley J. Passe, Seth C. Spiegel, and Hiroaki Nishikawa, Geometrically Flexible and Efficient Flow Analysis of High Speed Vehicles Via Domain Decomposition, Part 1, Unstructured-grid Solver for High Speed Flows}, JANNAF 48th Combustion 36th Airbreathing Propulsion 36th Exhaust Plume and Signatures 30th Propulsion Systems Hazards Joint Subcommittee Meeting Programmatic and Industrial Base Meeting, Newport News, VA, 2017. An implicit diffusion solver is analyzed to predict convergence rates for a range of a damping coefficient. The damping coefficient should be 4/3 or stay close to 1 for better accuracy and iterative convergence. Implicit Navier-Stokes solver can diverge for a small damping coefficient even when dominated by convection. A variable-preconditioner Newton-Krylov solver is demonstrated as a robust alternative, which converges even when the implicit solver diverges. Hiroaki Nishikawa, "Uses of Zero and Negative Volume Elements for Node-Centered Edge-Based Discretization", AIAA Paper 2017-4295, 23rd AIAA Computational Fluid Dynamics Conference, 5 - 9 June 2017, Denver, Colorado. [ bib | pdf | slides ] This is a preliminary attempt to prove that the 2nd/3rd-order edge-based schemes work with zero/negative-volume elements, and the uses of these elements are useful. Y. Liu and H. Nishikawa "Third-Order Edge-Based Hyperbolic Navier-Stokes Scheme for Three-Dimensional Viscous Flows", AIAA Paper 2017-3443, 23rd AIAA Computational Fluid Dynamics Conference, 5 - 9 June 2017, Denver, Colorado. [ bib | pdf | slides ] Extension of 3rd-order edge-based scheme to the viscous terms using a hyperbolic formulation. Jialin Lou, Lingquan Li, Xiaodong Liu, Hong Luo, Hiroaki Nishikawa, "Reconstructed Discontinuous Galerkin Methods Based on First-Order Hyperbolic System for Advection-Diffusion Equations", AIAA Paper 2017-3445, 23rd AIAA Computational Fluid Dynamics Conference, 5 - 9 June 2017, Denver, Colorado. [ bib | pdf ] Hyperbolic method is applicable to Discontinuous Galerkin (DG) methods. The construction pursued for DG is unique in that the number of unknowns can be reduced despite the increased number of equations in the target PDEs. See these personal notes, for the original thoughts on applying the hyperbolic method for DG. Lingquan Li, Xiaodong Liu, Jialin Lou, Hong Luo, Hiroaki Nishikawa, Yuxin Ren, "A Finite Volume Method Based on Variational Reconstruction for Compressible Flows on Arbitrary Grids", AIAA Paper 2017-3097, 23rd AIAA Computational Fluid Dynamics Conference, 5 - 9 June 2017, Denver, Colorado. [ bib | pdf ] This paper presents a method for implicit gradient computations (called variational reconstruction) for cell-centered FV schemes for compressible flow simulations. [ slides | seminar video ] A family of source term quadrature formulas has been derived for the third-order edge-based scheme for 1, 2, and 3 dimensions. A unique formula has been dicovered, which makes the third-order scheme completely free from second derivatives. The resulting third-order edge-based scheme is extremely efficient: no second derivatives are needed, and only linear flux extrapolation is needed. Jialin Lou and Xiaodong Liu and Hong Luo and Hiroaki Nishikawa, Reconstructed Discontinuous Galerkin Methods for Hyperbolic Diffusion Equations on Unstructured Grids, AIAA Paper 2017-0310, 55th AIAA Aerospace Sciences Meeting, 9 - 13 January 2017, Grapevine, Texas. [ bib | pdf ] This paper presents an extensive study on the hyperbolic reconstructed DG methods, including DG, and reconstruciton FV schemes for diffusion problems (including a tensor diffusion-coefficient matrix). Comparison with BR2 reveals that the hyperbolic rDG methods outperform the BR2 in terms of computational cost (CPU time). Y. Liu and H. Nishikawa, Third-Order Inviscid and Second-Order Hyperbolic Navier-Stokes Solvers for Three-Dimensional Unsteady Inviscid and Viscous Flows, AIAA Paper 2017-0738, 55th AIAA Aerospace Sciences Meeting, 9 - 13 January 2017, Grapevine, Texas. [ bib | pdf | slides ] This paper presents the unsteady extension of the 3D hyperbolic Navier-Stokes method in NASA's FUN3D code, focusing on third-order inviscid accuracy. A new source discretization formula was discovered, which achieves third-order acuracy on unstructured grids without computing nor storing second derivatives. H. Baty and H. Nishikawa, Hyperbolic Method for Magnetic Reconnection Process in Steady State Magnetohydrodynamics , Monthly Notices of the Royal Astronomical Society, 459, pp.624-637, 2016. [ bib | pdf | journal ] This paper presents the hyperbolic method for an incompressible MHS model. An important observation reported in this paper is a convergence slow-down for high-Reynolds-number problems. A resolution is proposed based on a modification of the length scale. Efficient High-Order Discontinuous Galerkin Schemes with First-Order Hyperbolic Advection-Diffusion System Approach, Journal of Computational Physics, Volume 321, 15 September 2016, Pages 729-754. Jialin Lou, Hong Luo, and Hiroaki Nishikawa, Discontinuous Galerkin Methods for Hyperbolic Advection-Diffusion Equation on Unstructured Grids, The 9th International Conference on Computational Fluid Dynamics (ICCFD), July 11-15, Istanbul, Turkey, 2016. [ bib | pdf ] This is the origin of the development of high-order hyperbolic Navier-Stokes schemes based on reconstructed discontinuous Galekrin (rDG) methods, which is a general framework including finite-volume and discontinuous Galerkin methods as special cases. An efficeint hyperbolic-scheme construction (Scheme-II) is extended to a modal DG method for diffusion based on the idea originated from these personal notes. This work eventually leads to high-order hyperbolic Navier-Stokes schemes. A First-Order Hyperbolic System Approach for Dispersion, Journal of Computational Physics, Volume 321, 15 September 2016, Pages 593-605 (AIAA 2016-3970). [ bib | pdf | journal ] A hyperbolic formulation is presented for a third-derivative in one dimension based on the original idea of the second author. This is based on a conference paper: AIAA 2016-3970 [pdf]. Y. Nakashima, N. Watanabe, and H. Nishikawa, Hyperbolic Navier-Stokes Solver for Three-Dimensional Flows, AIAA Paper 2016-1101, 54th AIAA Aerospace Sciences Meeting, 4-8 January, San Diego, California, 2016. [ bib | pdf ] This paper presents the first extension of the hyperbolic Navier-Stokes method to 3D with details of the 3D hyperbolic viscous system (e.g., left and right eigenvectors, absolute flux Jacobian without tangent venctors, etc). Anyone who wants to try the HNS method in 3D practical codes can consult this paper for details in the hyperbolic system and numerical algorithms. High-order shock-capturing hyperbolic residual-distribution schemes on irregular triangular grids, Computers and Fluids, Volume 131, 5 June 2016, Pages 29-44, 2016. [ bib | journal ] This paper presents shock-capturing high-order hyperbolic RD schemes on unstructured triangular grids. First-order Rusanov scheme is employed to capture a shock as well as to avoid expansion shocks. The nonlinear wave detection algorithm in [IJNMF2008, ICCFD2000] has been improved by a new thresholding. This is based on a conference paper: AIAA 2016-1331 [pdf]. H. Nishikawa and P. L. Roe, Third-order active-flux scheme for advection diffusion: Hyperbolic diffusion, boundary condition, and Newton solver, Computers and Fluids, 125, pp.71-81 2016. [ slides | seminar ] This paper extends the third-order active-flux scheme, which had been developed for hyperbolic systmes, to advection diffusion. The extension is unique in that the advective term is treated as a souce term. The scheme is constructed as an upwind scheme for diffusion, and the advective term is incorporated into the diffusion scheme as a source term. Numerical results are presented for steady and unsteady problems. Improved second-order hyperbolic residual-distribution scheme and its extension to third-order on arbitrary triangular grids, Journal of Computational Physics, 300, pp.455-491, 2015. [ seminar ] This paper introduces a new design principle for hyperbolic residual-distribution schemes. For second/third-order accuracy, we requrie that the residual is exact for quadratic/cubic solutions. This is a quite strong condition for conventional schemes, but it can be easily guaranteed for the hyperbolic schemes. The schemses designed with this principle are shown to produce highly accurate gradients on very distorted grids. This is based on a conference paper: AIAA 2015-2445 [pdf]. H. Nishikawa, Alternative Formulations for First-, Second-, and Third-Order Hyperbolic Navier-Stokes Schemes, AIAA Paper 2015-2451, 22nd AIAA Computational Fluid Dynamics Conference, June 2015. [ bib | pdf | seminar ] This paper introduces new hyperbolic Navier-Stokes formulations, HNS17 and HNS20. In particular, HNS20 is shown to lead 2nd/3rd-order accurate gradients for all primitive variables. Consequently, a superior scheme, Scheme II, can be constructed for the Navier-Stokes equations. Also, HNS20 allows us to construct superior schemes based on the hyperbolic RD schemes and also the active-flux schemes. This paper also introduces new techniques: artificial hyperbolic diffusion and dissipation, which are used to raise the order of accuracy of the velocity and density gradients by one order. H. Nishikawa, Active Flux for Advection Diffusion, AIAA Paper 2015-2450, 22nd AIAA Computational Fluid Dynamics Conference, June 2015. [ bib | pdf | seminar ] This paper extends the active-flux diffusion scheme to advection diffusion problems. A unique strategy is proposed where the advective term is treated as a source term to the hyperbplized diffusion system. Active-flux method is a compact high-order cell-centered FV scheme for unstructured grids. The cell-averaged solution is updated by the flux that evolves independently at cell faces. It achieves third-order accuracy within a compact stencil, with a much reduced number of degrees of freedom compared with DG methods. Upwinding mecahnism can be naturally built in the computation of the fluxes, and thus suitable for hyperbolic systems. Consequently, it is suitable for the hyperbolic diffusion. Y. Nakashima, N. Watanabe, and H. Nishikawa, Development of an Effective Implicit Solver for General-Purpose Unstructured CFD Software, C08-1, The 28th Computational Fluid Dynamics Symposium, December 2014. [ bib | pdf ] A robust implicit unstructured method was implemented into a commercial CFD code. Cpmparison among explicit and implicit time-stepping schemes with various options for the nonlinear solver (defect-correction or approximate Newton, and explicit pseudo-time stepping) indicates that the implicit time-stepping scheme with an approximate Newton method using accurate Jacobians yields the most efficient CFD computations. H. Nishikawa, Accuracy-preserving boundary flux quadrature for finite-volume discretization on unstructured grids, Journal of Computational Physics, Volume 281, January 2015, Pages 518-555, 2015. [ seminar video ] This paper presents a general boundary flux quadrature formula for the third-order edge-based finite-volume scheme on unstructured triangular/tetrahedral grids. It shows that the third-order scheme fails to achieve third-order accuracy without the general formula. Also it shows that the third-order edge-based finite-volume scheme does not require curved elements for curved boundary problems. This is a counter example for the claim "high-order methods require curved grids". H. Nishikawa, First, Second, and Third Order Finite-Volume Schemes for Navier-Stokes Equations, AIAA Paper 2014-2091, 7th AIAA Theoretical Fluid Mechanics Conference, June 2014. [ seminar video ] Built upon the previous developments [JCP2014-273, JCP2014-256], this paper presents first-, second-, and third-order implicit finite-volume schemes for solving the Navier-Stokes equations on unstructured grids. These schemes are constructed based on a hyperbolic formulation of the viscous terms. They are first-, second-, and third-order accurate on irregular grids for both the inviscid and viscous terms and for all Reynolds numbers, not only in the primitive variables but also in the viscous stresses and heat fluxes. Numerical results show that the developed schemes are capable of producing highly accurate derivatives on highly-skewed grids whereas a conventional scheme suffers from severe oscillations on such grids. Moreover, these first-, second-, and third- order schemes enable the construction of implicit solvers that converge intrinsically faster in CPU time than a conventional second-order implicit Navier-Stokes solver with the acceleration factor growing in the grid refinement. H. Nishikawa, P. L. Roe, and T. A. Eymann, Active Flux for Diffusion, AIAA Paper 2014-2092, 7th AIAA Theoretical Fluid Mechanics Conference, June 2014. [ bib | pdf ] Active-flux method is a compact high-order cell-centered FV scheme for unstructured grids. The cell-averaged solution is updated by the flux that evolves independently at cell faces. It achieves third-order accuracy within a compact stencil, with a much reduced number of degrees of freedom compared with DG methods. Upwinding mecahnism can be naturally built in the computation of the fluxes, and thus suitable for hyperbolic systems. Consequently, it is suitable for the hyperbolic diffusion. [ slides ] This paper demonstrates very high-order time-dependent computations, up to 6th-order by the first-order hyperbolic system method. High-order schemes are constructed simply by upgrading the source integration accuracy. The resulting discretization can be solved by a very powerful implicit solver, which is Newton's method for 2nd-order schemes, and works like Newton's method (with the same exact 2nd-order Jacobian) for 3rd-, 4th-, and 6th-order schemes. [ newspaper ] This paper presents first, second, and third order finite-volume schemes for advection diffusion. A simplified approach of constructing a scheme as a sum of independently developed advection and diffusion schemes is demonstrated for a wide range of Reynolds numbers, up to 1 million. Implicit solver is develped based on the Jacobian consistent with the first order scheme. The problem of loss of accuracy is illustrated, and it is shown that the problem does not exist for the hyperbolic method. Also, highly accurate and smooth derivative computation is demonstrated for skewed and stretched triangular grids. This is a great step towards the development of first, second, and third order finite-volume schemes for the Navier-Stokes equations. 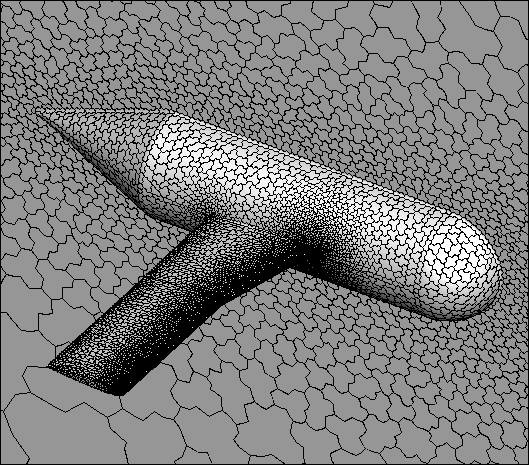 First-Order Hyperbolic System Method for Time-Dependent Advection-Diffusion Problems, NASA-TM-2014-218175, March 2014. [ bib | pdf ] This paper demonstrates, for the first time, the time-dependent computations by the first-order hyperbolic system method, extending the steady schemes developed in [JCP2007, JCP2010]. A very powerful steady solver is developed based on the hyperbolic formulation of advection-diffusion. It is used to solve the system of residual equations that arise from implicit time-integration schemes. The solver is so powerful that it is capable of solving the implicit-unsteady-residual equations with sufficent accuracy in less than 5 iteraitons. Note that the steady solver achieves second-order accuracy in the solution and the gradient, meaning that second-order accuracy is achieved in both the solution the gradient are obtained at every physical time step. This is a very important contribution, showing the first successful time-accurate computations by the hyperbolic schemes. H. Nishikawa and B. Diskin, Evaluation of Multigrid Solutions for Turbulent Flows, AIAA Paper 2014-0082, AIAA SciTech, June 2014. [ seminar video ] This paper shows several improvements on the agglomerated multigrid method in NASA's FUN3D code. [ seminar video | a derivation of Lr (pdf) ] This paper shows how straightforward it is to construct a robust first-order scheme and a super third-order scheme for diffusion. The idea is to write the diffusion equation as a hyperbolic system. Once it is done, a robust first-order upwind scheme gives an energy-stable first-order scheme for diffusion, and a very economical edge-based third-order scheme gives a super third-order scheme for diffusion. It is super because it achieves third-order accuracy in the solution as well as the gradients on a second-order stencil with O(h) time step. H. Nishikawa, B. Diskin, J. L. Thomas, and D. H. Hammond, Recent Advances in Agglomerated Multigrid, AIAA Paper 2013-863, 51st AIAA Aerospace Sciences Meeting, 7 - 10 January, Grapevine, Texas, 2013. [ bib | pdf | slides ] This paper reports recent advances in agglomerated multigrid for 3D unstructured and structured RANS simulations. Various difficulties and their resolutions are discussed. Also, problems with a single-grid solver are discussed. If we cannot obtain a unique solution with a single-grid solver, we cannot hope to accelerate the convergence or more fundamentally there is no point of accelerating the convergence in the first place. RANS solver development continues whether single-grid or multigrid. H. Nishikawa, Divergence Formulation of Source Term, Journal of Computational Physics, Volume 231, Issue 19, 1 August 2012, Pages 6393-6400, 2012. [ seminar video ] Yes, you can write a source term in the divergence form and discretize it by the method suitable for a conservation law, e.g., upwind or central flux. This paper shows how to do it. It is demonstrated that a third-order finite-volume scheme developed for hyperboic systems can be applied straightforwardly to the discretization of source terms. H. Nishikawa, New-Generation Hyperbolic Navier-Stokes Schemes: (1/h) Speed-Up and Accurate Viscous/Heat Fluxes, AIAA Paper 2011-3043, 20th Computational Fluid Dynamics Conference, June 2011. [ bib | pdf | slides ] Finally, the first-order hypebolic system method [JCP2007, JCP2010] has been extended to the Navier-Stokes equations. We propose a hyperbolic model for viscous flows, cast the system in the preconditioned conservative system, and discretize it by the 2nd-order finite-volume method. It is demonstrated that the resulting Navier-Stokes code converges O(1/h) times faster then a traditional code and yields 2nd-order accurate viscous/heat fluxes on irregular grids. Note that all we need is a numerical method for hyperbolic systems: the new Navier-Stokes scheme is upwind for all Reynolds numbers. This paper has just opened the door to the next generation of CFD codes. It is only the beginning. H. Nishikawa, Two Ways to Extend Diffusion Schemes to Navier-Stokes Schemes: Gradient Formula or Upwind Flux, AIAA Paper 2011-3044, 20th Computational Fluid Dynamics Conference, June 2011. [ bib | pdf | slides ] The general principle for constructing robust and accurate diffusion schemes presented in the previous conference has been extended to the Navier-Stokes equations. The paper discusses two possible extensions: one by the gradient formula implied by the diffusion schemes; the other via upwind fluxes applied to a hyperbolic model for viscous flows. That is, if you have a scheme for hyperbolic systems, you have a viscous scheme. This is a great chance for you to devise your own viscous discretization. H. Nishikawa and B. Diskin, Development and Application of Parallel Agglomerated Multigrid Methods for Complex Geometries , AIAA Paper 2011-3232, 20th Computational Fluid Dynamics Conference, June 2011. [ bib | pdf | slides ] Agglomerated multigrid method for fully unstructured 3D grids has been parallelized. Impressive speed-ups are demonstrated for inviscid and laminar flows, and RANS over realistic geometries. Here, we found that V(3,3) is more effectrive than V(2,1) for viscous flow computations. H. Nishikawa, Robust and Accurate Viscous Discretization via Upwind Scheme - I: Basic Principle, , Computers and Fluids, Volume 49, Issue 1, October 2011, Pages 62-86. [ bib | pdf | journal ] This is a short and revised version of the AIAA Paper 2010-5093. This paper introduces a general recipe for making `good' diffusion schemes for various discretization methods. A good diffusion scheme is defined as the one that has sufficient high-frequency damping and can be easily and efficiently integrated with an advection scheme for advection-diffusion problems. The general principle is demonstrated by deriving such diffusion schemes for node/cell-centered finite-volume, residual-distribution, discontinuous Galerkin, and spectral-volume methods. Comparison with widely-used schemes (Galerkin, average-least-squares, Bassi-Rebay, LDGs) show that new diffusion schemes derived from the proposed principle give significantly accurate solutions on highly-skewed (highly-stretched triangular) irregular grids. H. Nishikawa, Beyond Interface Gradient: A General Principle for Constructing Diffusion Schemes, AIAA Paper 2010-5093, 40th Fluid Dynamics Conference and Exhibit, June 2010. [ bib | pdf | slides ] This paper introduces a general recipe for making `good' diffusion schemes for various discretization methods. A good diffusion scheme is defined as the one that has sufficient high-frequency damping and can be easily and efficiently integrated with an advection scheme for advection-diffusion problems. The general principle is demonstrated by deriving such diffusion schemes for node/cell-centered finite-volume, residual-distribution, discontinuous Galerkin, and spectral-volume methods. Comparison with widely-used schemes (Galerkin, average-least-squares, Bassi-Rebay, LDG, Shahbazi's penalty schemes) show that new diffusion schemes derived from the proposed principle give significantly accurate solutions on highly-skewed (highly-stretched triangular) irregular grids. 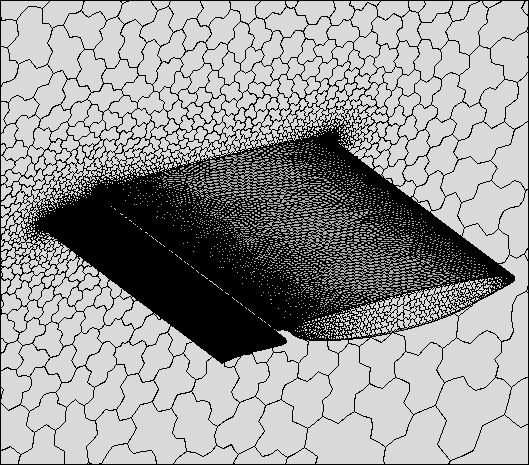 - Edge-difference form of a compact diffusion scheme. - Edge-normal and face-tangent least-squares FV-schemes are derived. These schemes can be implemented without face-tangent/edge-normal vectors. - Inconsistency of the Galerkin scheme under positivity enforcement. - The Bassi-Rebay scheme is derived from the central advection scheme. - Linearly-exact edge-based integration formulas are given for all elements. - Boundary weights for the edge-based formula are derived for all elements. H. Nishikawa, B. Diskin, and J. L. Thomas, Development and Application of Agglomerated Multigrid Methods for Complex Geometries, AIAA Paper 2010-4731, 40th Fluid Dynamics Conference and Exhibit, June 2010. [ bib | pdf | slides ] Agglomerated multigrid method for fully unstructured 3D grids is now demonstrated for inviscid and viscous flows over realistic geometries such as DPW and F6 wing-body combination. The method developed for a model equation has been extended to RANS simulations. J. L. Thomas, B. Diskin, and H. Nishikawa, Critical Study of Agglomerated Multigrid Methods for Diffusion on Highly-Stretched Grids , Computers and Fluids, Volume 41, Issue 1, February 2011, Pages 82-93. [ bib | pdf | journal ] The components of an efficient nodecentered full-coarsening multigrid scheme are identified and assessed using quantitative analysis methods. Fast grid-independent convergence is demonstrated for mixed-element grids composed of tetrahedral elements in the isotropic regions and prismatic elements in the highly-stretched regions. Implicit lines natural to advancing-layer/advancing-front grid generation techniques are essential elements of both relaxation and agglomeration. H. Nishikawa, A First-Order System Approach for Diffusion Equation. II: Unification of Advection and Diffusion, Journal of Computational Physics, 229, pp. 3989-4016, 2010. [ bib | pdf | journal ] Advection and diffusion equations are unified into a single hyperbolic system. Upwind schemes developed for the unified system are shown to have remarkable advantages: O(h) time step and uniform accuracy for all Reynolds numbers, accurate solution gradients, O(1/h) speed-up in CPU time over traditional schemes, etc. H. Nishikawa, B. Diskin, and J. L. Thomas, Critical Study of Agglomerated Multigrid Methods for Diffusion , AIAA Journal, Vol. 48, No. 4, pp. 839-847, April 2010 (formerly AIAA Paper 2009-4138). [ bib | pdf | journal ] Grid-independent convergence is demonstrated for diffusion by agglomeration multigrid on fully unstructured triangular/tetrahedral grids. It is found that a consistent coarse grid scheme is essential for the grid-independent convergence. H. Nishikawa, Towards Future Navier-Stokes Schemes: Uniform Accuracy, O(h) Time step, and Accurate Viscous/Heat Fluxes, AIAA Paper 2009-3648, 19th AIAA Computational Fluid Dynamics Conference, June 2009. [ bib | pdf ] A progress report on the development of radically new Navier-Stokes schemes: uniform accuracy, O(h) time step, and accurate viscous/heat fluxes for all Reynolds numbers. The first appearance in a conference of the first-order system approach for diffusion [Nishikawa, JCP2007]. [ bib | pdf | journal ] The state-of-the-art finite-volume schemes were compared for fully unstructured mixed grids. It was concluded that well-designed node-centered and cell-centered finite-volume schemes have comparable complexity and accuracy. H. Nishikawa, Adaptive-Quadrature Fluctuation-Splitting Schemes for the Euler Equations, International Journal for Numerical Methods in Fluids, 57, pp. 1-12, 2008. H. Nishikawa and K. Kitamura, Very Simple, Carbuncle-Free, Boundary-Layer-Resolving, Rotated-Hybrid Riemann Solvers, Journal of Computational Physics, 227, pp. 2560-2581, 2008. [ bib | pdf | journal ] This paper introduces very simple and robust Euler fluxes (Rotated-RR and Rotated-RHLL fluxes) constructed by combining the Roe flux with the Rusanov flux or the HLL flux in a rotated-Riemann solver framework. Extensive numerical experiments are presented to demonstrate their remarkable robustness and accuracy. In particular, the Rotated-RHLL flux is found to be extremely robust in terms of nonlinear instability. A subroutine of the Rotated-RHLL flux is available for download . H. Nishikawa, A First-Order System Approach for Diffusion Equation. I: Second-Order Residual Distribution Schemes, Journal of Computational Physics, 227, pp. 315-352, 2007. [ bib | pdf | journal ] This is the start of the first-order system approach for diffusion: integrate a hyperbolic diffusion system towards a steady state by advection schemes. It is shown that the FOS-based schemes give a tremendous speed-up to reach a steady state and produce accurate solution gradients simultaneously. A source code is available for download . H. Nishikawa, Multigrid Third-Order Least-Squares Solution of Cauchy-Riemann Equations on Unstructured Triangular Grids, International Journal for Numerical Methods in Fluids, 53: 443-454, 2007. [ bib | pdf | journal ] A very accurate third-order least-squares scheme is developed for the Cauchy-Riemann system on unstructured triangular grids. A multigrid method is applied to accelerate the convergence. 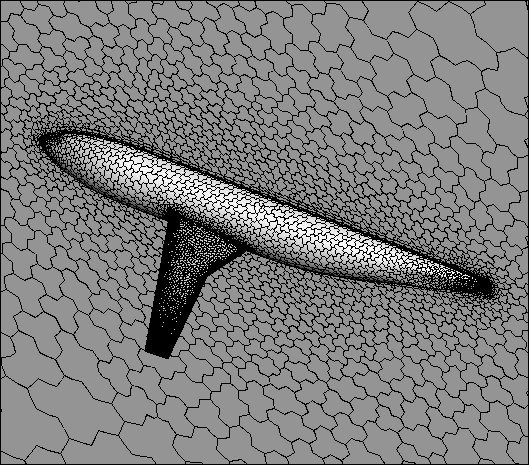 Optimal O(N) concergence is demonstrated for airfoil flows on fully unstructured grids. A simple fix for a locally bad coarsening ratio is proposed. H. Nishikawa and P. L. Roe, High-Order Fluctuation-Splitting Schemes for Advection-Diffusion Equation, Computational Fluid Dynamics 2006: Proceedings of the Fourth International Conference on Computational Fluid Dynamics, ICCFD, Ghent, Belgium, 10-14 July 2006, Springer 2009. [ bib | pdf ] Reconstruction-type high-order advection-diffusion schemes are presented. It is shown that the use of first-order system for diffusion is more economical than the original scalar equation. F. Ismail, P. L. Roe, and H. Nishikawa, A Proposed Cure to the Carbuncle Phenomenon, Computational Fluid Dynamics 2006: Proceedings of the Fourth International Conference on Computational Fluid Dynamics, ICCFD, Ghent, Belgium, 10-14 July 2006, Springer 2009. [ bib | pdf ] A new finite volume methodology is introduced to combat the carbuncle. The method features a more accurate treatment of entropy in the flux formulation at the cost of a small computational overhead. This new flux function is tested on a hypersonic flow past a circular cylinder on both structured quadrilateral and unstructured triangular grids, producing encouraging results. H. Nishikawa, Higher-Order Discretizatoin of Diffusion Terms in Residual Distribution Methods, in 34th VKI CFD Lecture Series, Very High Order Discretization Methods, VKI Lecture Series, 2005. [ bib | pdf ] Various strategies for diffusion in high-order residual-distribution method are discussed: high-order reconstruction, high-order elements, node-based and element based schemes. The use of the first-order system is discussed in terms of spatial discretization. H. Nishikawa and P. L. Roe, Towards High-Order Fluctuation-Splitting Schemes for Navier-Stokes Equations , AIAA Paper 2005-5244, 17th AIAA Computational Fluid Dynamics Conference, Toronto, June 2005. [ bib | pdf ] High-order fluctuation-splitting(residual-distribution) schemes are proposed for P2 elements. The P2 Galerkin scheme is shown to be a Richardson's extrapolation of the standard Galerkin scheme. The P2 LDA scheme is introduced (later found to be flawed). P. L. Roe, H. Nishikawa, F. Ismail and L. Scalabrin, On Carbuncles and Other Excrescences , AIAA Paper 2005-4872, 17th AIAA Computational Fluid Dynamics Conference, Toronto, June 2005. [ bib | pdf ] We report observations of numerical experiments involving the carbuncle phenomenon. highlighting three distinct phases in its development. We stress that the second and third stages are logically consistent consequences of the rst stage, which can largely but not wholly be explained by a one-dimensional nonlinear stability analysis. However, we do not present a cure, and are careful not to promise one, although we do feel free to criticize others. H. Koyama and H. Nishikawa, Numerical Method for thermally unstable hydrodynamics, Fluid Dynamics Conference in Japan, August 2004 (in Japanese). [ pdf ] In this paper, we study the Runge-Kutta Discontinous Galerkin (RKDG) Method for the Euler equations with thermal diffusion and stiff source term. We use the local discontinous Galerkin (LDG) approach to discretize the diffusion term. Numerical examples show good performance for resolving stiff relaxation problems. The RKDG method is a useful numerical method for thermally unstable radiative hydrodynamics. H. Nishikawa and P. L. Roe, On High-Order Fluctuation-Splitting Schemes for Navier-Stokes Equations, Computational Fluid Dynamics 2004: Proceedings of the Third International Conference on Computational Fluid Dynamics, ICCFD, Toronto, 12-16 July 2004, Springer, 2006. [ bib | pdf ] It is shown that simply adding an advection scheme to a diffusion scheme results in a loss of accuracy for advection-diffusion problems. The use of first-order system for diffusion term is proposed (for the first time) to avoid this problem and achieve uniform accuracy. NB: In the book, Figure 2 is wrong. Download a pdf here. It has the right figure. H. Nishikawa, On Simple Wave Solutions, (Unpublished, May 2003), in " I do like CFD, VOL.1 ", pp. 140-146, 2009. [ bib | pdf ] A general derivation of exact simple wave solutions for conservation laws. Examples are given for the Euler and the ideal MHD systems. General exact solutions for entropy wave, acoustic waves, and Alfven waves are derived, which can be used for a code verification purpose. H. Nishikawa and B. van Leer, Optimal Multigrid Convergence by Elliptic/Hyperbolic Splitting, Journal of Computational Physics, 190, pp. 52-63, 2003. [ bib | pdf | journal ] An optimal O(N) multigrid convergence is demonstrated for the Euler equations. The idea is to decompose the Euler system into elliptic/hyperbolic parts and apply full/semi-coarsening to elliptic/hyperbolic part. (Presented at the 32nd AIAA Fluid Dynamics Conference, St. Louis, June 2002, AIAA Paper 2002-2951). H. Nishikawa, P. L. Roe, Y. Suzuki, and B. van Leer, A General Theory of Local Preconditioning and Its Application to the 2D Ideal MHD Equations, AIAA Paper 2003-3704, 16th AIAA Computational Fluid Dynamics Conference, Orlando, June 2003. [ bib | pdf ] A recipe for constructing a local preconditioning matrix is presented and applied to the 2D ideal MHD system. It shows how a general hyperbolic system can be decomposed into a set of scalar advection equations and a set of 2x2 Cauchy-Riemann system. Also, a very fast algorithm to solve an quartic equation is devised. P. L. Roe, K. Kabin and H.Nishikawa, Toward A General Theory of Local Preconditioning, AIAA Paper 2002-2956, 32nd AIAA Fluid Dynamics Conference, St. Louis, June 2002. P. L. Roe and H. Nishikawa, Adaptive Grid Generation by Minimising Residuals, International Journal for Numerical Methods in Fluids, 40: 121-136, 2002. [ bib | pdf | journal ] Presented at ICFD Conference on Numerical Methods in Fluid Dynamics, Oxford, U.K., 2001. It is based on the material of the Ph.D. thesis of Hiroaki Nishikawa. H. Nishikawa, M. Rad, and P. L. Roe, A Third-Order Fluctuation-Splitting Scheme That Preserves Potential Flow, AIAA Paper 2001-2595, 15th AIAA Computational Fluid Dynamics Conference, Anaheim, June 2001. [ bib | pdf ] A third-order Euler code based on an elliptic/hyperbolic decomposition is presented. The Fraenkel flow (non-uniform enthalpy flow) was used to verify the third-order accuracy and to demonstrate its ability to capture small recirculation zones (which are tiny and get smeared out easily by conventional schemes). Hiroaki Nishikawa, On Grids and Solutions from Residual Minimization, Ph.D. Thesis, Aerospace Engineering, University of Michigan, 2001. [ bib | pdf | slides ] An automatic mesh adaptation by minimizing residuals: simultaneously solve for solutions and nodal-coordinates. The nodal movement, which is driven by non-vanishing residuals, is shown to reflect the physics of the governing equations. Interesting geometrical approach is also discussed using the exterior calculus. H. Nishikawa, M. Rad, and P.L. Roe , Grids and Solutions from Residual Minimisation, Computational Fluid Dynamics 2000: Proceedings of the First International Conference on Computational Fluid Dynamics, ICCFD, Kyoto, Japan, 10-14 July 2000, Springer, 2001. [ bib | pdf ] A residual-driven mesh adaptation technique is presented for a model hyperbolic equation. A one-parameter family of second-order quadrature is introduced for a flux integral; a suitable parameter value is found for exact shock-capturing. Also, a way to detect nonlinear (shock/expansion) waves over a triangular element is introduced. M. Rad, H. Nishikawa and P. L. Roe , Some Properties of Residual Distribution Schemes for Euler Equations, Computational Fluid Dynamics 2000: Proceedings of the First International Conference on Computational Fluid Dynamics, ICCFD, Kyoto, Japan, 10-14 July 2000, Springer, 2001. [ bib | pdf ] An expansion shock is observed for residual distribution schemes for the Euler equations. A fix is proposed based on a one-parameter family of second-order flux integral. H. Nishikawa, Accurate Piecewise Linear Continuous Approximations to One-Dimensional Curves: Error Estimates and Algorithms, Unpublished, 1998. [ bib | pdf ] A simple algorithm to discretize a smooth curve (such that L2 error is minimized) is devised. It generates nodes successively from one end to the other using the slope information. A robust iterative formula is devised to perform the process stably. Applications to curve fits, adaptive numerical integrations, and numerical solutions of stiff ordinary differential equations (for both IVP and BVP) are discussed.